Bring home the DREAM9 now! The ANSWER Coalition stands in solidarity with the nationwide movement to bring home the nine undocumented youth now referred to as the DREAM9. Three of the DREAM9, Lizbeth Mateo, Lulu Martinez and Marco Saavedra, are undocumented immigrant activists and have lived in the United States since they were young. They organize with DREAM Activist and the National Immigrant Youth Alliance. In an act of civil disobedience, the three returned to Mexico to visit their families earlier this summer. Mateo had not seen her family living in Mexico for 15 years, and Martinez had not seen her family for 20 years. Without authorization to return to the United States, the three risked being turned away upon return or future deportation. They left the United States to unite with other immigrant youth who had been deported or left due to family circumstances. Claudia Amaro and her 13-year-old U.S. citizen son, Yamil, joined the group in Mexico. Amaro had left the United States when her husband was deported years earlier. 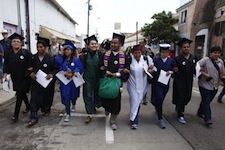 On July 23, the group of nine undocumented immigrants, including the three who departed the United States most recently, arrived at the border in Nogales, Arizona asking Immigration to grant them admission. Thousands of supporters watched live in-person and online. Rather than granting admission to the Nine, the Department of Homeland Security placed them in detention. This violates the stated detention and deportation priorities of the Obama administration – which claims to focus enforcement on “high priority criminals.” They remain in detention as of the writing of this report. While in detention, they are organizing and speaking with the other detained immigrants, exposing how the deportation system really functions to terrorize immigrant workers and their families. The ANSWER Coalition demands unconditional family reunification for the 1.7 million immigrants deported under the Obama administration and all families torn apart by deportation. We support the DREAM9 in demanding that the deportations end and that families be given protection from further separation. The U.S. immigration system terrorizes immigrant workers and families and destroys communities. It scapegoats immigrants for the harm caused by the political and economic policies of the elites. As the debate over immigration reform continues in the House of Representatives, we must be organizing in the streets. We must show the politicians that immigrant families refuse to accept a future of deportation and terror, and that we will fight until immigrants win full equality. One opportunity to build this critical struggle will take place on August 17 in Washington D.C. The ANSWER Coalition is joining Women Organized to Resist and Defend, DMV-LOLA (Latinas Organizing for Leadership and Advocacy), the National Asian Pacific American Womens Forum, and other immigrant rights and women's rights groups for an immigrant rights unity rally at noon in front of the White House. Come out and support the demand for full rights for all immigrant communities! Sign a petition demanding the release of the DREAM9 here!